There are many, many varieties of cabbage—mainly because of the historical need to have crop coming in as a regular flow rather than more or less all at once. Since we use cabbage mainly for borscht or freezing for other cooking uses, one variety of each kind (green and red) is enough. We will repeat here what we now say about all Brassicas. For a long time, we made the mistake many amateur Brassica growers make, that of trying to race against summer with cool-weather crops. Even with fairly early plantings, if the crops don’t mature very quickly, the weather gets warm then hot, and your cabbage (or other Brassica) crop is largely or wholly shot. The answer, especially in this era of continuous global warming, is easy: because all Brassicas are quite tolerant of rather cool to cold weather (some actually need some frosting to achieve peak flavor), one simply plants the seeds in mid to late summer and harvests in late fall or even early winter. If the plants don’t grow as fast as we might like, no harm done because they can withstand the cool/cold weather of late fall and early winter. A lot of sources insist that cabbage should be started indoors as seedlings. 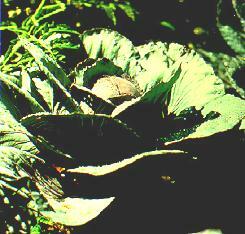 But they are talking about spring-planted cabbage, which, as we said above, seems a useless fight against nature. If we are summer-planting for late-autumn harvest, for us the seeds will go in the ground around late June (for the 100-day one) or early July (for the 80-day one), which is scarcely a time when one worries about poor l’il seedlings getting frosted down. So, obviously, we direct-sow. For our exact climate, we will be seeding the red cabbage on June 22nd and the earlier green on July 12th. The nice thing about fall harvest is that we don’t need to be too exact about dates, because the plants can go pretty deep into autumn and early winter. With those planting dates and the nominal days to maturity, both types should be ready for harvest around the very end of September—but if they ignore the calendar by a bit, who cares? They’re not going to bolt. What a change from spring planting! Sow seed ¼ to ½ inch deep. Like broccoli, thewy want about a 16" spacing in a deep-dug bed. Cabbages, like most or all brassicas, are fairly indifferent to soil type and pH, but do want well-drained soil; some sources say they prefer a slightly alkaline soil, a hair over 7.0. They are also said to prefer a “heavy” soil, so—within reasonable bounds—clay is not a problem. And while it is reputedly not fussy about needing direct sun, direct sun is how they grow best. They are heavy feeders, and want well-fertilized soil. Again like most brassicas, cabbage prefers moist soil and doesn’t mind—even likes—wet leaves, so water regularly and generously (just don’t get the soil actually sodden or waterlogged). It is quite important that their water supply be regular: cabbages experiencing dry then wet can readily crack. Cabbages are members of the Cruciferae family, Brassica genus. All crucifers are highly vulnerable to clubroot disease; the only reliable way to avoid it is crop rotation, with a minimum four-year pattern recommended. Saving seed from crucifers is inadvisable for the nonexpert: even the experts have problems, both with cross-breeding—crucifers very readily cross—and with disease. Of the many other food crops closely related, a few are kale, Brussels sprouts, kohlrabi, broccoli, cauliflower, radishes, turnips, rutabagas, watercress, and mustard. The old, original Brassica oleracea ancestor is native to the Mediterranean region of Europe, and is somewhat similar in appearance to a leafy canola plant. Sometime soon after the first domestication of plants, that ancestral “cabbage” was being grown as a leafy vegetable around the Mediterranean. Because the leaves were the part of the plant consumed, those plants with the largest leaves were selectively propagated for next year’s crop. If you have ever envied the simple, easy life of vegetables, you can visit The Page That Turns You into a Cabbage! (their title, not ours). You loaded this page on Friday, 19 April 2019, at 16:49 EDT. It was last modified on Monday, 28 January 2019, at 21:53 EST.